The Airlink bus runs regularly from the airport to Waverley Bridge (Edinburgh City Centre). Full details of this service can be found at Lothian Bus's Airport services . From Waverley Bridge we are an easy 20 minute walk via St Andrews Square, Dublin St, East London St, Bellevue (all mostly downhill) or, if you're not feeling energetic, you can check Lothian Bus route planner for options, specifying from Waverley Station to Bellevue. The number 8 bus is usually the best option and from the stop at Bellevue it's only a 2 minute walk down East Claremont St.
Alternatively you can take the tram from the airport to its last stop at York Place, and then it's only a 10 minute walk to us down Broughton Street to Bellevue. A taxi from the airport direct to us should cost no more than £25 (medium traffic). 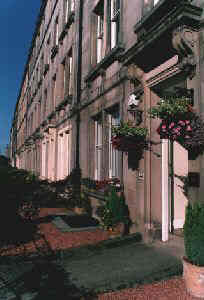 The B&B is an approximate 20 minute walk from Waverley Station if you are feeling energetic. For Bus options see the previous section about getting to us from Waverley Bridge. Or take a taxi from one of the ranks within or just outside the station. The B&B is an approximate 10 minute walk from the Bus Station. If you exit onto St Andrew's Square then follow the directions from Waverley Bridge, above. If you take the rear exit, onto York Place, follow the directions above from the last tram stop. Ample street parking is available but is metered from 08:30 to 17:30. Mon - Fri, (£2 per hour with a 4 hour maximum). We can usually provide vouchers (limited supply) for all day parking, Mon to Fri, at an extra cost of £10 per day. Parking at weekends is free of charge from 17:30 Friday evening to 08:30 Monday morning. Free parking is available at all times 10 minutes away, outside the Central Controlled Parking Zone, along Broughton Road (B900 on map below) past the McDonald Road junction. Please Note: We are family-run with no staff so arrival must be arranged in advance and our last check-in time is 10pm.